Anyway, thats why I kept my last comment for posterity sake. While I understand and accept that Chukwudi has 1–million% rights over his StrictlyOnlineBiz blog, to do and undo, I also believe that the reason for at least allowing comments to any post on the blog is to give readers an opportunity to air their views and contribute; knowing fully well that these views can be positive or negative, for or against you(the blogger) and whatever you have to say / should have said. The comments I left on Chukwudi’s blogpost were not against his StrictlyOnlineBiz / the particular post, but to air my sad experience with Web4Africa, his webhosting company. While he writes that Web4Africa Hosting was cheap and reliable blah blah blah, I narrated my ordeal with the same company, that the service I paid for since January 2009 hasn’t gotten off the ground in November 2009, and yet Web4Africa has not given me a refund. David of web4Africa responded, and all he had to say was that my comments should not be taken seriously. So much for someone who should make an apology and provide service. Theres no need to wonder why Chukwudi had to delete the comments, (how can you allow comments that make your webhost look bad – if you expect good service), and I would count such an action as very very very very cheap. Or maybe Web4Africa’s David has pulled some strings here and there so that the comments would be deleted and leave the make Web4Africa look good post intact. 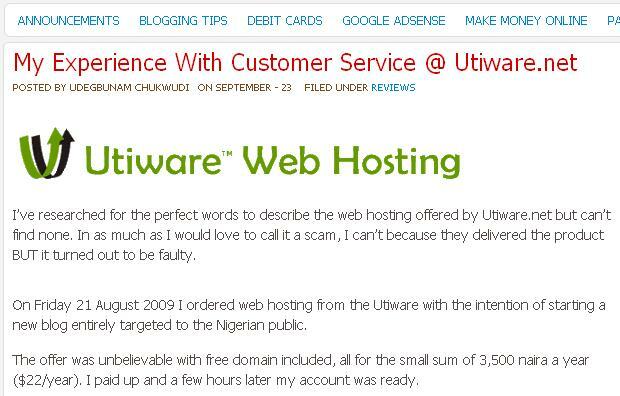 And how then does Chukwudi expect readers to believe his Customer Service Experience with Utiware.net was free and fair, when one of the commenters on the post says he has been hosting with the same company for about 2–years and had no problem with them? What I’m trying to say is while one man’s meat is another man’s poison, Chukwudi should not have deleted the comments. If I were in his shoes, even if I wanted to close comments to the particular post (so that the argument would stop on my blog), I would have left previous comments as is, and still published. Or worse still, I could have deleted the entire post, so as to maintain my own neutrality. I actually smelt a merry go round when I first read the post, I just wasn’t sure. Now I am. But I do believe that freedom of speech includes the right to complain about products and services, and if personal sentiments or attachments are allowed to override level headed thinking, what do we have left. If you say the product is good and I say its bad, the third guy coming would have the good and bad news to refer to. Please note: Whatever I have to say about David and Web4Africa is NOT A LIE, and my complaints are all valid. I have emails from him and his staff to prove my point. I have transcripts of our chat sessions saved. He himself cannot refute any of my statements. What I want now is not service, I just need my refund. It has been a wasted year with Web4Africa. Until I get a refund, as far as I am concerned, I have been scammed by Oluniyi David Ajao and his Web4Africa webhosting company.